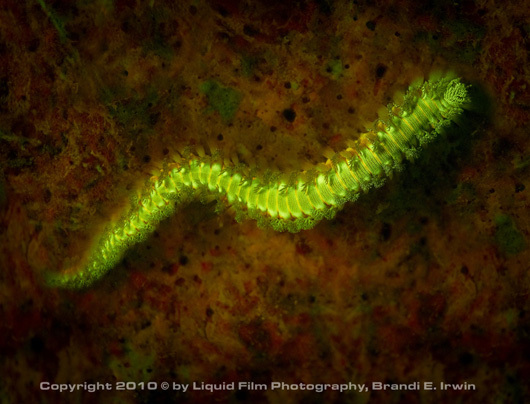 Brandi Irwin gives us a peek into her world of underwater fluorescence photography. After modeling for many years in New York City, I decided to step behind the camera and combine photography with my love of the oceans; to capture unique images in unique situations. Black...pitch black. This is a shooting environment that I especially love and where I find the most unique marine creatures. When other photographers are reviewing their pictures from a day of diving, I am found heading out with my team to shoot underwater under the cover of night. Orange ball corallimorph with extended tentacles, photographed in Bonaire. F4.5, 1/125, ISO 400, 60mm. 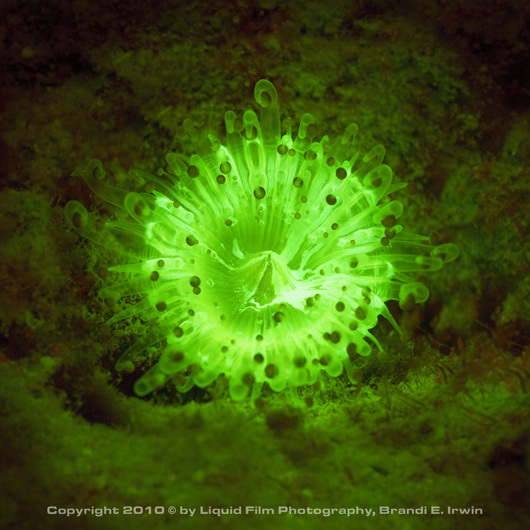 A special phenomenon that occurs among some marine creatures at night is fluorescence. Fluorescence is the absorption of one wavelength of light (e.g. ultraviolet), or color and the re-emission of another. Under low spectrum light, the object absorbs the light and re-emits a totally different fluorescent color, transforming it into a brightly glowing object. 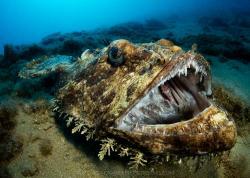 I soon discovered that very few professional underwater photographers have explored this phenomenon, so I wanted to be the first to focus on this specialty and share it with the public. Fluorescence is not very well understood, even in the scientific community, so there is no playbook on finding subjects to shoot. 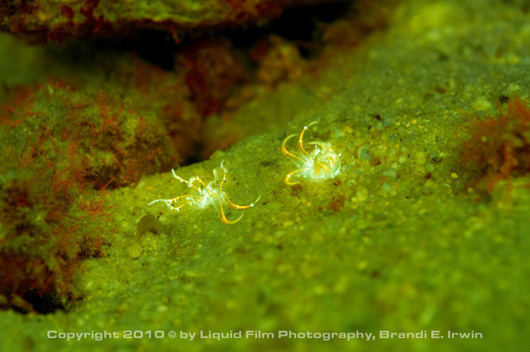 Different marine creatures fluoresce under different spectrums, so experimentation here has been key. The ability to instantly see my shots using digital cameras has helped in finding and identifying subjects. Also, my team members scan the depths with filtered lights to locate additional subjects. As with any new skill-set, keeping good notes helps create reproducible images. Ultraviolet (UV) light is electromagnetic radiation with a wavelength shorter than that of visible light. It is named because the spectrum consists of electromagnetic waves with frequencies higher than those that humans identify as the color violet. UV light is emitted by electric arcs and specialized lights such as black lights. It can cause chemical reactions, and causes many substances to glow or fluoresce. 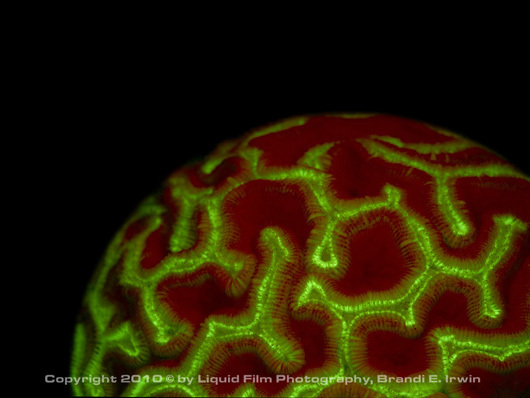 Fluorescing brain coral. F8, 1/60, ISO 400, 60mm. 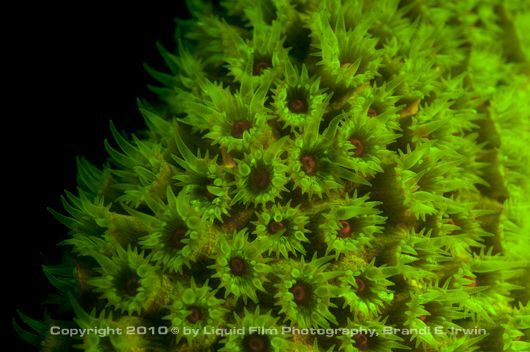 I shoot with a Nikon D300s in an Ikelite housing and two Ikelite strobes. However, shooting fluorescence involves either special (black) lights or special filters. There are a number of filters you can purchase online or from scientific optic companies. Through experimentation I found a combination of filters that gives the best results and even had to DIY the best way to attach them to my strobes. Difficulty didn't stop there, I also had to experiment with exposure as traditional camera settings don't often produce good results. Pair of fluorescing young banded tube anemone. F8, 1/60, ISO 400, 60mm. Bearded Fireworm. F8, 1/60, ISO 400, 60mm. Since this is an emerging area of photography and my images were distinctly different from others I've seen, we easily captured the attention of the public. To jumpstart the process though, I hired a publicist to help increase awareness of my gallery exhibits. I also contacted the New York Aquarium, showing them my unique images and how it can help increase interest with the public - now I have an exhibit opening there on August 5th, 2011. Marketing has been a work in progress as there has been no 'big break' (yet). The key I believe is in developing relationships with people that are co-beneficial and to focus on your uniqueness. 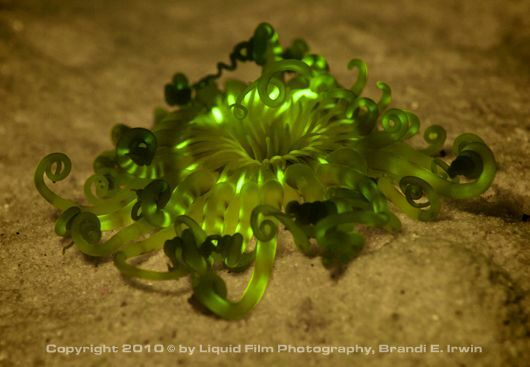 Fluorescing banded tube anemone. F8, 1/80, ISO 200, 60mm. Great star coral. F5.6, 1/100, ISO 400, 60mm. During this time I founded a photography company, Liquid Film Photography, to focus on extreme underwater imaging, including model and fashion shoots underwater. Together with a core team of photographers and videographers, we are following a fairly standard business strategy of both offline and online sales. In addition to our gallery prints for sale, we created a website to sell our images online and started a social media campaign on Facebook and Twitter to build awareness and drive traffic. 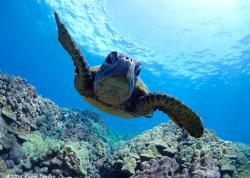 I am also kicking off a nationwide tour of exhibits of underwater photography. Liquid Film Photography is currently based in New York City and Chicago. Not only do they specialize in shooting fluorescent marine life, Brandi Irwin also shoots models and fashion underwater, bands, and product studio/stock photography underwater. Brandi has an exhibit opening at the New York Aquarium August 5th running until August 31st, 2011, followed by an exhibit at the Oklahoma Aquarium. More of Brandi's underwater photography can be seen at LiquidFilmPhotography.com. Dive looking for interesting animals. 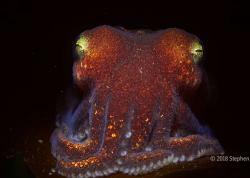 Use a UV light to find animals that fluoresce. Take a photo with a filter on your strobes that blocks all light except "near UV" light (i.e. emits blue light). Have a filter on your housing or lens that blocks the "near UV" light. Hence - only the fluorescent light will hit your sensor! Learn how to do it yourself! Submitted by jester on Mon, 2012-04-09 07:31.